Run north up Main Street, give a nod to the Clarence DeMar monument in front of Ell Pond and the history of long running in Melrose that it represents. Bear right on to Green Street, and then turn right at the lights onto the LynnFells Parkway. Follow that into Saugus, through a set of lights, and up to the Saugus entrance of Breakheart Reservation on your left. Run up the road to the Headquarters of the park and find the water stop car. Hydrate up at water stop 1, 3 miles into your run. Go into the park entrance on the right and run the full loop of the park (stay right at the fork by the pond). You’ll start with the flatter side of the loop and end with the hilly side. There are 5 of them, although there always seem to be more than that. The last one will give you momentum to shoot back into the parking lot for another stop 6 miles into your run. If you’re running “short”, you’ll return to Melrose Center the way you came. Leave the park, take a right on the LynnFells Parkway, turn left onto Green and merge back onto Main to finish up your 9 mile run. If you’re running long, you’ll be now running on what used to be the Wakefield version of the Law Enforcement Memorial Half Marathon, which ran for a few years after the race left Melrose and before the race moved to Boston to become the Run to Remember Half Marathon. You’ll do this by leaving the park, then take a right on the LynnFells Parkway, then turn right at the set of lights at Main Street in Saugus. This road will take you into Wakefield where the name of the road changes to Farm Street. Stop at Wakefield High School for water stop 3 at mile 9. Once on Lowell Street keep running straight, it’ll bring you to Lake Quannapowitt. Stay right at the Lake and turn left onto Quannapowitt Parkway at the north end of the Lake. You’ll come up to the Comverse Building. There will be a water stop in the parking lot of the office park, aout 12.5 miles into the run. Keep your eyes on the look out, the position of this water stop tends to vary. Continue along Quannapowitt Way out to North Ave, where you’ll turn left. Follow North Ave to the softball fields at a set of lights where you’ll turn left on to Church Street. This will bring you to a church, where you’ll turn right onto Common Street, next to Wakefield Common. This will merge you on to Main Street (which will not bring you to Maine). It will bring you to Nick’s Pizza on the corner of Nahant Street where you’ll find the final water stop of the run at mile 15. Three miles left! And they’re all straight south along Main Street. When you hit Melrose Center you are done! Ok, water stop help. I need quite a bit of it. Two volunteers would make this route much easier to handle, although we could pull it off with one volunteer. We’ll work the water stop at Breakheart, then one person will move up to the third stop. After the last runner comes through the first water stop will move to Lake Q. After the last runner comes through Wakefield High School, that person moves to Nahant. That’s where the timing gets tricky if the fastest runner gets 15 done before the last runner gets 9 done. It’s rare, but it has happened. So who can help? And that’s the plan for this week. Who’s in? ROLL CALL! Hey SLR, it’s not every week you can experience a 60 degree difference from one SLR to the next. With last week’s -9 degree run, with wind chills making it even more cold than that, we’ll rebound with a run that is predicted to be in the 50s before we’re done! This week’s route is up Main Street with a left turn on Franklin Street. Follow through Franklin Square and up into Stoneham. Keep going past Stoneham High School and keep going all the way to Stoneham Center, turning left on Main Street. Cross over as you approach Friendly’s, where water stop 1 will be in the parking lot there, on your right. After the stop, running short? Turn left at the lights and run up past the Stone Zoo. Turn left on Pond Street and scamper down to Grimsby’s. Turn left there and follow the Lynnfells Parkway up past Melrose High School. Turn right on Melrose Street, and then right again onto Main Street. Finish up your run by running strong through Melrose Center back to the Knights of Columbus. Running long? You’ll continue along Main Street as it becomes the Fellsway West on the back side of Spot Pond. Turn left on Elm Street and run up to the Highland Ave rotary. Turn right there onto Highland Ave and find the water stop somewhere along that road. After the water stop you’ll continue on to the traffic circle on the other end of Highland. Go left there and run along the other Fellsway (East), through the hills to Grimsby’s. Surprise, this time you’ll turn left and head up the hill back to Spot Pond. Turn right at the pond, run past the Zoo and continue to Friendly’s. The water stop will still be there for you. You’ll leave the water stop, and as the temps rise, remember this stretch of Main Street was covered by many feet of snow and patrolled by one angry plow driver at this time last year. Roll up your sleeves and run back to the way you came, right on Franklin Street, back through Franklin Square, and right on Main Street. Head back to the KofC to finish up for the day. I’ll cover the Friendly’s stop. I’ll need one volunteer to hang out at Highland Ave. Roll Call. Who’s in? No excuses, it’s not dangerously cold! Ok, We may have a decision to make. This Sunday will be very frigid, predicted to be near zero at the start of the SLR. While dangerous, as long as you dress right and avoid exposed skin, a run in temperatures that cold is doable. I’ve done it (a tip, a layer of vaseline on your face works wonders). My question to the group is, if the Knights is available, do you prefer running in heavy traffic on a slightly warmer Saturday SLR, or do you prefer to brave the cold on a quiet Sunday morning SLR. Weigh in here, should the S stand for Saturday or Sunday for this week’s SLR? I’ll post later tonight if we’ll be changing the run to Saturday of sticking with Sunday. The day was chosen, we’re running tomorrow, Sunday, February 14, 2016. Not only is it Valentine’s Day, but it is also forecast to be one of the coldest days in the past decade. Back when Over the ten year history of the Sunday Long Run we’ve had a few days in the single digits, but I’m not sure we’ve run below zero, which may hit tomorrow. Also the wind will be blowing, which could make it feel like its about 20 below tomorrow. Get those warm running clothes ready. Here’s a few tips for running in the cold… Dress in layers. For tomorrow’s weather wear three layers on top and two layers on bottom. The inside layer should be a tight layer, this will work like a wetsuit trapping warmth against your skin. Keep your extremities warm. Mittens are better than gloves, your fingers will like the warmth from their friends next to them. Better yet, a light pair of gloves inside a pair of mittens. Feet, wear warm socks. For the boys, yinvest in warm weather windbriefs, I’ve found some at REI and they were worth it! Wear some sort of balacava around your neck. This will allow you to pull it up over your face when you feel you need it as well. Wear a winter hat to trap the heat in, and if its water resistant that’ll keep it from icing up from your sweat. Remember, no matter how well you dress, you’ll have some exposed skin. If you put a layer of vaseline on your face, your wrists and your ankles that’ll protect the skin from the cold, reducing the risk of frostbite especially when its windy. If you do all these things you’ll be ready to tackle the cold. Just in case though, bring some additional layers to the start with you in case you decide you need to change something mid-run. This week’s route will stay local, just in case of emergency, you’ll never be more than 2 miles from the Knights of Columbus. Here’s the plan: ValentineRun. The run will be a clover leaf with the Knights of Columbus in the center. If that sounds too St Patrick’s Day for you, imagine it’s four hearts. The four loops will leave the KofC, head off to a Melrose neighborhood, and return to the KofC for a water stop. That’ll give you a few seconds to rehydrate out of the cold before you head out for the next loop. Long runners do all four loops, shorter distance runners only do the first two loops. Loop 1: Start going up Main Street towards Wakefield for a run through the Horace Mann neighborhood. After Franklin Street, move over to the right side of the road as you’ll be turning right on Baystate Road. You’ll turn right onto Damon Avenue which will bring you down to the Horace Mann School. The road will curve to the left after the school and end at Cochrane Street. Turn right on Chochrane then another right onto Howard Street. Howard will end at Green Street, you’ll merge to the left onto Green at a triangle island. Green will cross the LynnFells Parkway and bring you onto Main Street. Take Main back into Melrose Center and come back to the Knights for a water stop. Loop 2: Continue down Main Street to West Wyoming. Turn right on W Wyoming, crossing to the left side and take a left on Ravine Road. Ravine will take you to the Fellsway East, turn left on the Fellsway, run the hills and stay left as you the approach the traffic circle at Highland Ave. turn left on Highland and then a very quick left onto Glenwood Street. Glenwood will take you over to Oak Grove. Go straight through the set of lights and head over the Orange Line tracks. Continue to the next set of lights and turn left on Main Street. Head back to Melrose Center and stop back in at the Knights of Columbus. Running Short? You’re done. Running Long? Loop 3: Continue on Main Street heading north again. This time when you get to Franklin Street, turn left. Run through Franklin Square and up to Perkins Street where you’ll turn left. Perkins will bring you down to the LynnFells Parkway. Right on the LynnFells to Grimsby’s. Turn left on W Wyoming, back to Main and back to the Knights for another warm water stop. Loop 4: Cross Main Street onto East Foster and head up to Melrose Common. Turn right on 6th Street and follow that as it turns into Swains Pond Avenue. 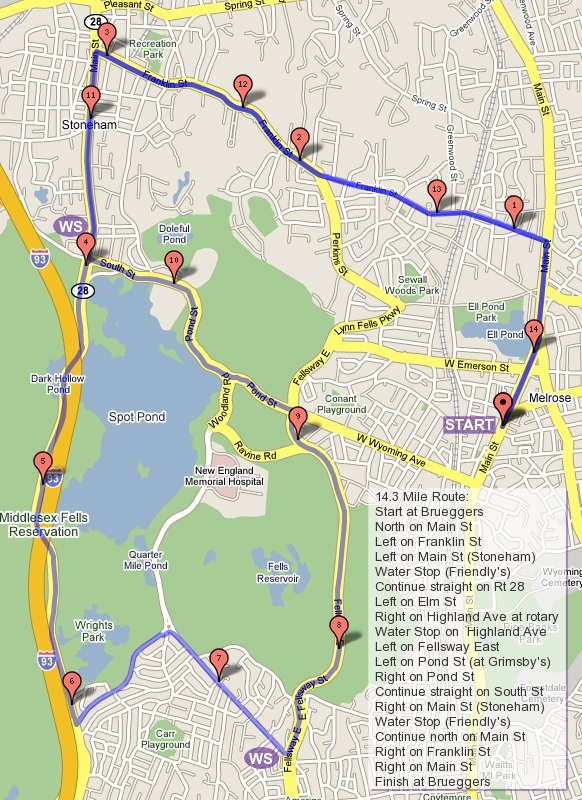 We’ll end the run with a loop through the quiet Swains Pond section of Melrose. Follow Swains Pond Ave up to Turners Pond, where you’ll turn at the stop sign to stay on Swains Pond Ave. At the end of Swains Pond Ave you’ll be at the In&Out Convenience Store on Lebanon Street, where you’ll turn right. Follow Lebanon back to East Foster and turn left to get back to the Knights. And you’re done! For water stops, I’ve had offers from Tom, Paul, and Denise but since I’m planning one stop, inside of the Knights, I won’t need that much help. I would like at least one helper though to make sure runners get in and out as quick as possible (enough to warm up, but not enough to sweat too much). That’s it. Who’s in for the Frozen Valentine’s Day Sunday Long Run?! ROLL CALL! I’m back… just in time for snow to come and screw up the route. This week was supposed to be a return to Breakheart, but when Winter Storm Lexi decided she wanted to travel a little farther north than originally planned a change of plans was required. Unless you want to traipse through about 8 inches of snow on the Breakheart Hills, we’ll move the route over to Spot Pond. Hopefully that gets cleaned up a little. Look at the route for week 2 for this week’s run. We’ll leave the Knights of Columbus promptly at 8AM. With the snow try to run single file, stay close to the edge of the road, run towards oncoming traffic when possible, and be aware that when the sun is behind you that means its in the eyes of the cars approaching you. Don’t assume you’re seen. Be safe. Start the run by head south on Main Street passing Dunkin Donuts and turning right at the next set of lights onto West Wyoming Ave. Follow W Wyoming all the way to Grimsby’s and turn left on to the Fellsway East. Run the hills and find your way to the traffic circle at Highland Ave. Turn right onto Highland and come find me on Highland for a water stop. After the water stop, if you’re running short stay to the right at the rotary at the end of Highland and run Woodland on the front side of Spot Pond to Pond Street where you turn right. This week your run should be around 6 miles, so when you get to Grimsby’s keep going straight back along W Wyoming to Main. Turn left on Main Street and finish up back at the Knights. If you’re going long, go left at the rotary at the end of Highland onto Elm Street. Follow that to the end, go right onto the Fellsway West, Rte 28. Follow that as you go under I93, then over I93. Turn right into the Straw Point parking lot. If I get a volunteer there will be a little water stop there. If I don’t get a volunteer, grab so snow and hydrate on that. The parking lot will bring you out onto New South Street which will turn into Pond Street as you pass the Stone Zoo, then it will turn into Woodland as you pass the pond. Keep following straight through the various street names until you find the rotary at Highland again. I’ll be on the other side with the water stop. After the final water stop, run along Highland taking your first left on East Border Road. Run to the first set of lights and turn left on the Fellsway East. A few hills will take you to Grimsby’s, continue straight onto the LynnFells Parkway. That’ll take past Melrose High School, where you’ll turn right on Melrose Street, and another quick right onto Main Street. Follow that through downtown Melrose and back to the Knights of Columbus. Any questions? No? Ok, then its time for the roll call. Who’s in for this weeks run?